I have read so many wonderful books to my class this year. We have touched on every genre, from my personal favorite, Flora and Ulysses, to Martin Luther King, Jr.’s biography. But the hands down favorite, even of my beloved rapscallions, is this piece of historical fiction from Laura Ingalls Wilder. “I liked it because like Cole said, there’s a lot of action. And, my favorite part was the scream in the night with the panther screaming, and then the Indian shot it.” ~M. J. These smart children of mine. They know that a good book is beautiful writing, an interesting story, and lessons we can take away with us after reading it. And to think they’re only eight years old. The comments on this book are great. I remember having read all of this series and loved it to death. Such good books. Especially like the comments of Romaan and Erjon. Thanks for sharing what these wonderful children thought. I love all of their comments and it is nice to know that they can enjoy a book that I enjoyed at a very similar age. I don't think I have read this book but all those statements you shared are humbling to read. I love it when kids have such honest opinions about books. That's awesome. This is one of those books I've never read, always wanted to, but I'm waiting for my girl to be of age so we can discover it together. FAB share dear. 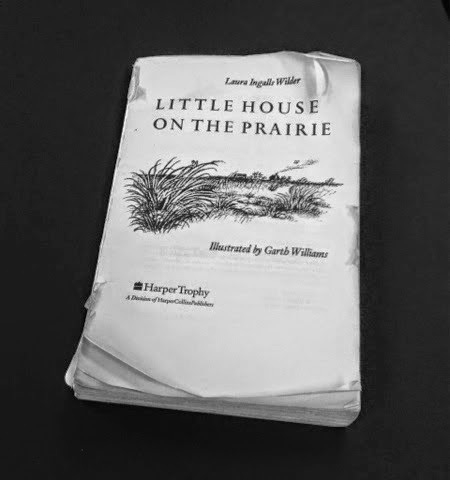 I was introduced to the Little House books in 4th grade. We loved them. And, to be quite frank, any writer would do well to throw out the how-to bestsellers in favor of this post. There's a lot of wisdom here about what readers want! I love this post. I like hearing what children like about books. It's so spot-on. That said, I've never read these myself but wouldn't mind getting a copy. I love fiction of the prairie and have read a lot of Willa Cather and Louise Erdrich. I have been a little put off reading this series from what I've read of Ma's attitude towards Native Americans. I suppose you have to keep a sense of time and place when reading novels from earlier times, though. When I read Willa Cather, in high school, I found her boring beyond belief. Funny, since I loved the Little House books (all seven of them). I should pick up Cather's My Antonia again. As far as Ma's attitude toward the Native Americans, I was shocked reading this time around. I understand she was fearful of them, but what I never saw before was how the pioneers felt it was their rightful place; no one considered the Native Americans at all. Children are amazingly astute when it comes to literature. My classes have never failed to pick the pick over the film, the book over the play. They know what it is to listen, and absorb the story, better than I know myself. Thanks, Suko, for reading them. I think they are humbling, too. Imagine the last two boys knowing such truths at such a young age! It's funny that no matter how many times I read them, and it's been countless over my childhood and teaching years combined, they never disappoint. I look at them from new perspectives of course, but always enjoy the stories. As well as the lessons. I think that's the mark of a good book: enjoyment over the ages. Isn't it fun how many of us readers have enjoyed these books? Thanks for reading their thoughts/my post. I have many suggestions if you're looking for more books, Lindsey. Personally, I try to hit all genres at least once in order to expose them to as many books as possible in the year. But, the year is never long enough for all I want to read to my class! I loved these books so much as a child, I used to beg my mother to make me calico dresses (she did!). I am glad to know they span generations. And yes, smart kids! I had the same experience reading this as an adult – shocked at Ma's attitude toward Native Americans. Absolutely missed this as a child. I agree with Vintage Reading though that it needs to be read with a sense of the time and place in which it was written. This is true of many other works as well when they reflect the people of the times. Good points. Such a wonderful post with all those quotes from your students! I loved the Little House series when I was younger. I was sad that my daughter had no interest in them when she was a little girl, but maybe my granddaughter would like to read this one with me when she comes to visit in July. Have your summer break begun? Lincoln schools ended right before Memorial Day Weekend. So early!